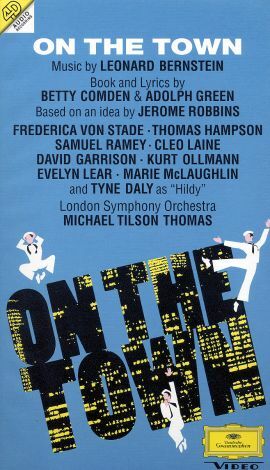 The 1992 Broadway cast performs Leonard Bernstein's musical comedy On the Town, based on an idea by Jerome Robbins. Three sailors -- Gabey (Thomas Hampson), Chip (Kurt Ollmann), and Ozzie (David Garrison) -- run around New York City when they are granted shore leave. In 24 hours time, they manage to meet three city girls (Frederica von Stade, Tyne Daly, and Marie McLaughlin). The music is performed by the London Symphony Orchestra under the direction of Michael Tilson Thomas, with chorus master Terry Edwards conducting the London Voices. Lyricists Betty Comden and Adolph Green provide video narration.